Real Name: Gohan, Son of Goku. Health: 140 Karma: 46 Resources: Pr(4), Rm(30) with the Z-Team. Age: 11 Height: 5'2" Weight: 92LBS. Talents: Martial Arts B, D & E (Chinese Shadow Boxing, Iron Fist, Shotokan, Kick-Boxing, Goju, Tae Kwon Do, Tai Chi), Tumbling, Acrobatics, Student. Contacts: Z-Team (Rm Resources, Hero Group), Goku(Father), Princess Chi-chi(Mother), Avengers(Hero Group), Turles and Raditz(Uncles, deceased), Ox King(maternal grandfather), Bardock(paternal grandfather, deceased). Growth - Atomic Gain: permanent, 20' tall, weight of 4 tons, is +1CS to hit, Un(100) Strength, Un(100) Endurance, Health is changed in proportion. Kinetic Control: Am(50). Unusual for any Saiyan, Gohan has shown the potential to develop psionic abilities. He is able to create a kinetic pulse field which simulates a range radius Kinetic Bolt at In(40) rank within a 40' range radius. Unfortunately, this power only manifests when he is either enraged(flaring) or berserk. Gohan can emit a Kinetic Blast from his entire body which does In(40) force damage with a range radius of 4 areas centered on his body, but can only be activated unconsciously. The first instance of this was in the World's Strongest Movie----"It's all your fault!!!!!!!!!" By using the kinetic pulse field, Gohan can reduce a slugfest attack used against him by 40 points. This is due to the fact that he can dampen kinetic energy used against him. This includes force attacks. He must make a Yellow Psyche FEAT to use this and can only do this while flaring. By using the kinetic pulse field, Gohan can reduce the intensity of energy attacks used directly against him by -1CS. He must make a Green FEAT to use this. He can only do this while flaring. By making a Green Psyche FEAT, Gohan can harness the latent kinetic energy within his body to unleash kinetic bolts of Rm(30)(In(40) if flaring) intensity and range. Force Field: Mn(75) active only. He must make a Yellow Psyche FEAT to activate this power. He can take no other action while using this power. The force field cannot be projected and is centered on himself. He can, however expand the field at -1CS field strength per additional area. By making a Yellow Psyche FEAT and a Green Endurance FEAT, Gohan can focus his kinetic energies into a concentrated beam of energy that that does Am(50) force damage and Ex(20) energy damage. This is his version of the Kamehameha. Disruption: In(40). Gohan can focus his kinetic energies into a punch or kick for 1-5 turns. Attacks made during this time are considered to do both blunt and energy damage. He can only use this when berserk. Berserker: Am(50). Not only do his physical stats increase but every single one of his powers increase +2CS for the duration of the rage. Gohan doesn't remember the events that occur during his rages. When in his berserker state, Gohan automatically power flares. This flare lasts for the duration of the rage. Power Detection: By training with the other members of the Z-Team, Gohan has developed this power at Rm(30) rank and range. Unfortunately, it only detects organic life. Resistance to Power Detection: Through following his father's training regimen, Gohan has developed the ability to psionicly mask his power. This means that powers such as Power, Life, Energy, and Mutant Detection are at -4CS to track him. When Frieza's henchmen tried to scan for Gohan's power signature with their scouters, Gohan showed up as a small animal. True Flight: Rm(30). By making a yellow power FEAT, Gohan can combine his hyperspeed with his flight to travel for 1-5 turns at Am(50) air speed. Weakness: See Saiyans. Being only Half-Saiyan, Gohan is +4CS to resist his genetic instincts. Gohan lost the Uzaru form after Piccolo removed his tail permanently. At this point, Gohan is not afraid of his power, so he doesn't lose Karma for its use. Gohan's berserker state is unstable, meaning that every 1-5 turns he must make a successful Endurance and Psyche FEAT to maintain it. If he fails he automatically suffers the downside of flaring and loses 10 Health points. Gohan is the son of Goku and Princess Chi-chi. At the age of 2, Gohan's latent Saiyan(mutant) powers manifested. They were triggered by survival instincts. At the age of 5, Gohan was kidnapped by the Nilbogs known as Garlic Jr. and the Spice Boys. Goku, Krillin, and Piccolo battled the Nilbogs. Garlic Jr., now Immortal from a wish granted by Shenron, nearly beat the 3 heroes within an inch of their lives. It was the enraged Gohan who, seeing his father brutally beaten by Garlic Jr., went berserk and flung Garlic Jr. into the Dead Zone. Amazed at the potential of his son, Goku decided to one day train him in the martial arts. Unbeknownst to Goku, Gohan's surge of power was detected by the Saiyan mercenary named Turles. Turles and his crew soon landed on Earth to investigate the possibility of Saiyans on the planet as well as to plant a seed of the Tree of Might. The Z-Team rushed to investigate the appearance of the planet-draining tree. They were soon in battle with Turles' crew. During the battle Turles captures Gohan and reveals that he is his uncle. Turles then created a globe of artificial moonlight to awaken the hidden power inside Gohan. The young half-Saiyan transformed into an Uzaru for the first time. Goku's worst fears had come to pass. His son had inherited his genetic "curse". Gohan's primal rage overwhelmed Goku. Fortunately, for everyone, Gohan's pet dragon---Ikarus---calmed him down. Frustrated at having his plans thwarted, Turles decided to destroy Gohan. 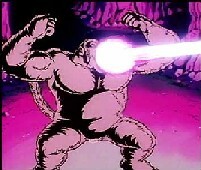 Goku interfeered and caused his brother's energy blast to damage Gohan's tail. This caused Gohan to revert to his humanoid form. A year later, Gohan's true potential was revealed for all to see during the Z-Team's battles with Dr. Willow and Raditz. After witnessing the utter chaos inherent in Gohan, Piccolo decided to train him for battle with the coming Saiyans. Within a year's time Gohan's powers and physical abilities had doubled. Unfortunately, his resistance to his genetic instincts became a liability in the Z-Team's battle with Vegeta, Nappa, and later with Lord Slug. It was during the Z-Teams mission to Planet Namek Prime that Gohan's powers grew. The Eldest Namek, Guru, unlocked the sleeping powers within the boy's mind and body. This was not evident until Gohan's rage brought Frieza to his knees. Years later Gohan joins the Z-Team in their battles against Kooler, Hatchyak, and Metal Kooler. It is only after his training for battle against the Androids that he is made a full member of the team. He is only 11 years old. When the biological android known as Cell appears, Goku senses the hidden threat of Cell's perfect form. Goku decides to push Gohan beyond the level of a Super-Saiyan.